On one of the mornings while I was in chicago, I actually had time to play real-life “i work in downtown chicago” lady and took full advantage. 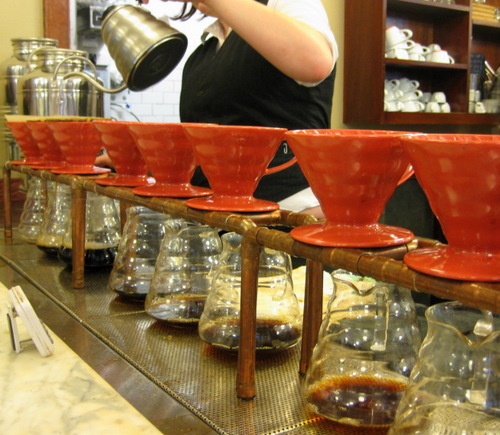 I had discovered the night before that I could walk to a nearby Intelligentsia for a coffee. Whee! They do everything themselves (roast the beans, grind, etc.) and brew their coffees using these little ceramic coffee drippers, by pouring in the water using these special water kettles. It’s all a big to-do. Such a to-do that you have to wait in long lines for it. But that’s ok. I didn’t mind the wait. 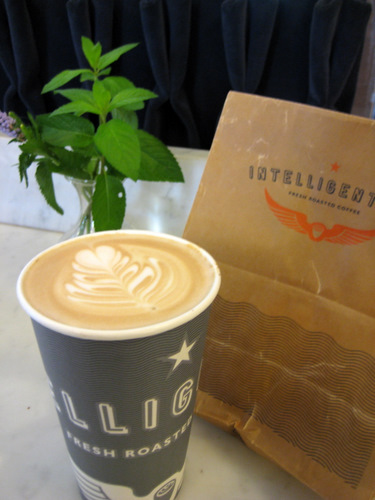 Since going to an Intelligentsia happens maybe once every year or so, the wait is fine by me. 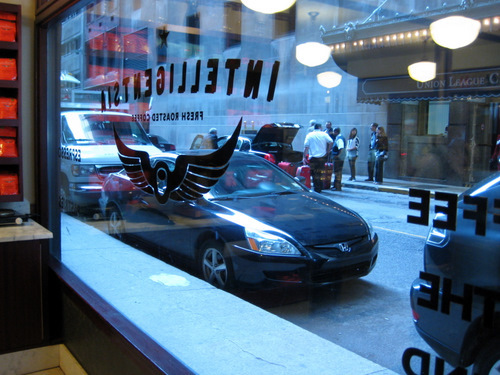 This visit was my second trip to an Intelligentsia, ever. The first was at the Silver Lake location. This chicago location is small, but very cute. There are a few tables and a small counter. I got a large latte and I drank it all! It was absolutely lovely! It is strong and wonderously creamy. My body was practically in shock because of how strong it was. But it was all worth it! I got a danish too. Even their pastries, or at least the ones they carry, are good!